Aachen Hbf is one of four German border-stations, where different voltage systems meet. On this page more information on the station is given. 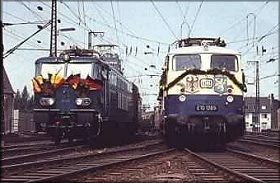 May 1966 saw the introduction of electric traction between Germany and Belgium. On the DB line Köln-Aachen 16 2/3rds Hertz, 15kV AC power was used, whilst the voltage on the Belgium section Liège-Aachen was 3000V DC. Aachen Hbf was chosen for conversion to a system changeover point, as the tracks and platforms were no longer sufficient for the increasing international traffic. Platform roads of 400m length, additional through-tracks for freight trains, a higher number of stabling-tracks for passenger trains and a new signal box (Gleisbildstellwerk) should make for smoother operations. Simultaneously to the changing of running-lines the right voltage is switched on. The layout is compatible to international trains either with changing of single-voltage locomotives or with multiple-voltage locomotives. New signal- and power systems had to be developed to reach a smooth and safe cooperation of all types of traffic and to prevent danger to both man and material even in case of mistakes. into Köln Hbf in May 1966. Construction of 400m long platforms, at least for the international traffic, as the former 250m platforms didn't allow for economical usage and the improvisations often reached the permissible limits. Special pass-through tracks for freight-trains to the Netherlands and Belgium (via Montzen) to Aachen West. 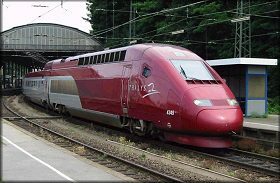 Constructional alternatives to a system changeover-point to Belgium; development of a track layout, which allows a smooth change of electric locos and which is capable of handling the increasing number of through carriages. Improvement of the layout to avoid operational handicaps, especially in the sidings. The mentioned lengthening of platforms was only possible in the western part, because the bridge "Burtscheider Talbrücke" hindered any alterations to the east. Enough space for the run-through tracks could only be created by decreasing the width of platforms and giving up the cargo platform between platforms 3 and 4. 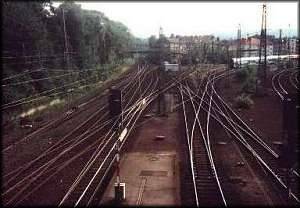 Lay-over sidings with three tracks for AC locos and through carriages was built beyond the Burtscheider Viaduct. Track 11 at the east end of the platforms serves for waiting DC locos. At the west part of the station track 73 is used for AC locos and track 74 for DC locos. The total track length of the new station is about 13,575m compared to 12,400m in the old layout, whilst the number of points increased from 118 to 130. 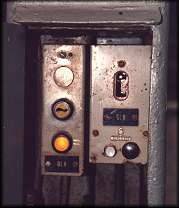 During the rebuilding there were 28 different SIGNAL-CONDITIONS. The operational management in Aachen Hbf is complicated by the steep grade towards Aachen Süd (Belgium), which has an average gradient of 26‰ (1 in 38). The heavy passengers-trains (more than ten I11-coaches / 500 tons) have to be pushed from the back, because the performance of SNCB 16/18 is not sufficient or the force on the couplings is too high. In these cases DB 215 or 36x are used, on the Belgium side between Liège and Leuven SNCB 2500 bank heavy passenger-trains. If more coaches are needed (e.g. in D-trains 24x), Eurofirma coaches are chosen, because each is ten tons lighter than the I11-coaches. In east-west direction the enormous incline demands special protective measures. The speed of passenger-trains is limited to 50km/h. The departure signal in Aachen Süd may only be switched to green, when the platform road behind the red home signal in Aachen Hbf is free in its complete length. If the INCOMING-SIGNAL in Aachen Hbf is switched to green, there has to be an in front of vowel additional 300m bypass-track behind the "Burtscheider"-Viaduct.